Simply by nature of what I do, I end up switching beauty products a lot. Part of working in beauty is trying new things, so even if you find something you love, you end up cheating on it with some other hot new thing. There are exceptions to this though, especially with skin-care. Although I will always try new beauty products, once I find something that works for my skin--or that I'm particularly excited about--I can end up being loyal to it for quite awhile. 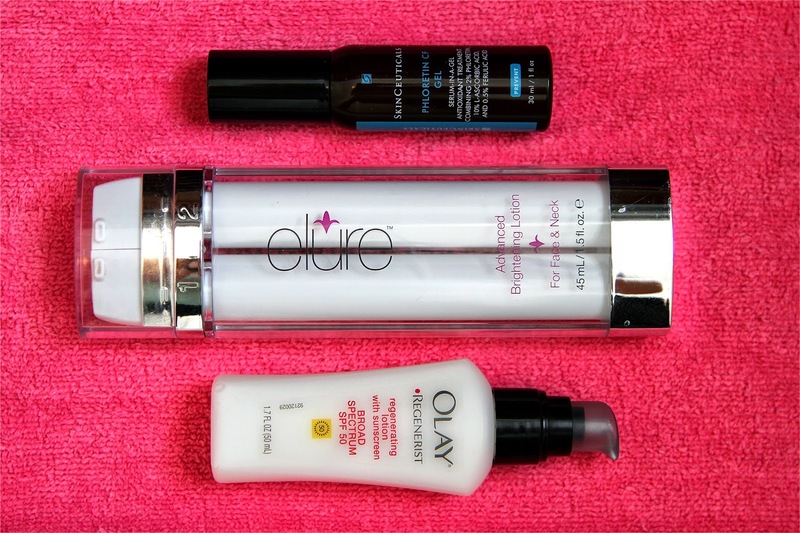 Here are three products that I'm totally committed to. I use them every single morning--and don't plan to stray any time soon. Elure Advanced Brightening Lotion - This is the newest addition to my regimen. Here's why it made the cut: Over the past year or so, it has seemed like every other dermatologist I have interviewed has been recommending this product. Seriously. After I heard it mentioned for what must have been the tenth time, I decided there had to be something to it. It is a two-step system (you apply a lotion and then follow with a second "activator" lotion) that claims to reduce discoloration and even out skin tone. I don't have huge pigmentation issues, but I do have a few spots that I'd love to see disappear. I've been using it for about a month now, and while it obviously hasn't (yet!) totally erased my spots, my skin is noticeably brighter and clearer overall. I'm excited to keep using it and see what it does after another month or two. Olay Regenerist Regenerating Lotion SPF 50 - I've been using this one for years. Years. Here's the thing: I have access to (literally) the fanciest, most expensive creams in the world for free, and this is what I use. I really love it. It's incredibly light--moisturizes effectively but doesn't feel at all greasy or heavy--and it's got a very high SPF, which is super important to me. Also, I have sensitive, breakout-prone skin, and I've never had a problem with it in that way, and that is key. So, that's the trio that I slather on every morning, without fail. :) Do you guys have an anti-aging regimen that you stick to or any favorite skin-care products? If so, please tell me in the comments below--I'd love to hear what you love! I love when you do posts like this! You have access to the best of the best, so when you say something's legit I listen! I would love to read about your nighttime routine too. I just turned 31 and am starting to add in and think more about anti-aging in my skin are products. Can I ask what your thoughts are on Stri-Vectin vs Neocutis (Biorestorative Cream)? Or just Stri-Vectin in general? I'm currently using a Retin-A from my Derm Doc, but want to add in a really good moisturizer (can't do too pricey) that I can stick with for the long term. I'd love to hear your thoughts! And yes, please do share your nighttime routine!